Randy has his Saturday Night Genealogy Fun challenge up on his blog, Genea-Musings. This week we are to run a statistics report on our genealogy database. 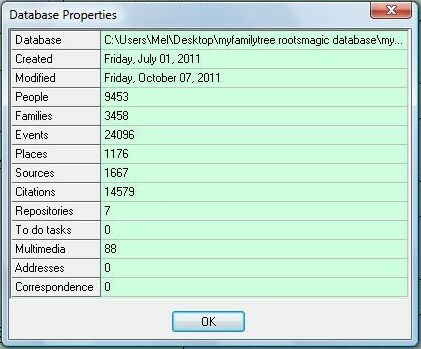 I use RootsMagic 3.2.2. I got to my statistical report by going to File > Properties. I combined all my databases into one database over the Summer. This reflects my entire genealogy now. I think my source and citation numbers would be much higher had I not wiped them out years ago doing a software upgrade. I decided to more forward and have recovered some of what I lost at the time. I think it’s nice to reflect on these stats. I can see how much I have accomplished with my tree.